(AP) -- An attorney for Apple Inc. defended the company's use of Eminem's songs on iTunes in court on Thursday, as a trial got under way to determine who had the right to offer digital downloads of the rapper's music. Eight Mile Style LLC, Eminem's music publisher, and an affiliated company, Martin Affiliated LLC, say their contract with Aftermath Records, which controls the recordings, did not entitle it to strike a deal with Apple to sell 93 songs over iTunes. The case involves millions of dollars and the creative rights behind the hip-hop star. But the issue for the judge here in the rapper's hometown is narrow: What do contracts between Eight Mile and Aftermath say about the ability to peddle songs beyond traditional compact discs? In his opening statement, Apple lawyer Glenn Pomerantz said it's a case of "common sense." "Nowhere does it say only compact discs. Nowhere does it say ... not digital downloads," he told U.S. District Judge Anna Diggs Taylor. Record companies like Aftermath have rights to use the recordings and the compositions - "otherwise they couldn't sell records," Pomerantz said. Apple pays Aftermath 70 cents for each iTunes download, and Eight Mile gets 9.1 cents of that share as the music publisher, he said. Despite the legal dispute, Eight Mile cashed royalty checks and hasn't asked Apple to stop selling Eminem's songs, Pomerantz said. "They've been paid a lot of money. We don't begrudge them that," he said. "But they're not entitled to that money and Apple's profits." Eight Mile's lawyers claim Apple has wrongfully gained $2.5 million through iTunes downloads, including $466,915 from Eminem's biggest hit, "Lose Yourself." They say Aftermath has collected $4 million off his songs on iTunes. Eight Mile attorney Richard Busch said the publisher has a history of making legal distinctions between digital downloads and other ways to distribute Eminem's music. 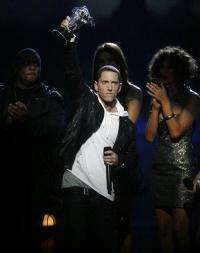 He referred to an agreement with Universal Music Group to offer "Lose Yourself" as a download before iTunes was created. "The publisher owns these compositions, not Aftermath. ... If Eight Mile had a direct licensing relationship with Apple, this kind of nonsense would not happen," Busch said. Pomerantz said Apple doesn't make that kind of deal. The first witness was Eight Mile manager Joel Martin, who said the publishing company can't protect itself financially without a download license with Apple. "We can't look at their records. We can't look at their books. We can never make a claim against Apple - ever," he said. Eminem, whose real name is Marshall Mathers, was not in court. He is not a plaintiff in the lawsuit and is not listed as a trial witness. "He's well aware of what's going on," said Mark Bass, a songwriter and producer who, with his brother Jeff, is credited with launching Eminem's career. "It's important to all songwriters across the board." The trial could last a week or more. The judge is not expected to hear any music, but Pomerantz held up an unusual prop during his opening statement: a 1940s album by late crooner Bing Crosby. He used it to explain the history of a music "album" and how song delivery has changed over decades.